Feeling the heat? Try this strawberry smoothie which is sweetened using a date puree which means this tasty beverage is sugar free (apart from the naturally occurring sugars in the fruits). Soak some dates in cold water overnight then blitz them in your food processor the following day. Keep the date paste sealed in an air tight mason’s jar to add to smoothies, cakes, yoghurt or porridge. 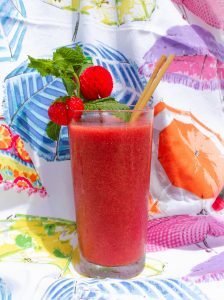 To make this Strawberry Mint Cooler take a handful of strawberries, a few fresh mint leaves and a tablespoon or two of date paste (it will depend how sweet you like it) then blitz in a mixer or in a narrow jug with a stick blender. Add a drop of two of chilled water if needs be. Serve over ice and enjoy.